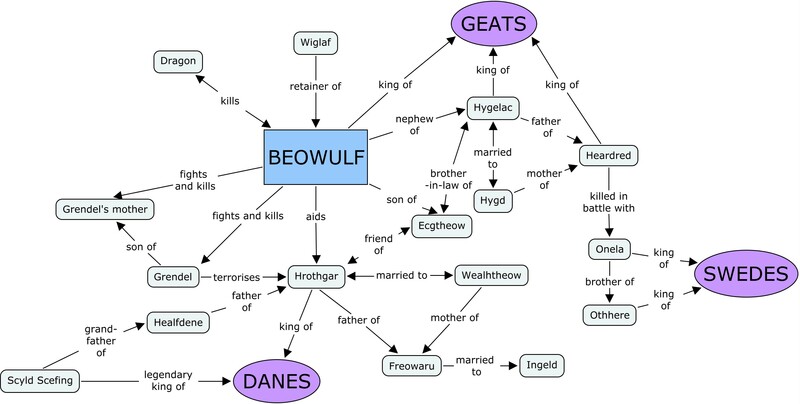 Concept-map of the characters in Beowulf. Some issues and themes to consider when writing about Grendel's fight with Beowulf. Are there similarities to be found in the depictions of Grendel and Beowulf? Look particularly at the ambiguous pronoun "he" at line 708 and the description of Beowulf's state of mind. The phrase "wæs gehwæþer oðrum lifigende lað" (ll. 814-5) are also telling, as the tight structure of "gehwæþer oðrum" mimics a close relationship, almost like a man and his shadow. Consider the word "aglæca". This word is used both of Grendel and his mother (who is "aglæc-wif"), of the hero Sigemund and of Beowulf himself. The translation of the term as "monster" in the context of Grendel and his mother which was common in earlier scholarship seems, therefore, to be problematic. The presentation of Grendel in this extract is very detailed in its concentration on internal states and intentions. A sense of his thoughts and feelings allows for a certain tension to be created, as the audience can see what he intends and wait to see the outcome. It also differentiated Grendel from a simply animalistic monster. In fact, we can understand him in far more detail than we ever understand the "wælwulfas"/Vikings of Maldon. The hall, Heorot, is described in detail in this extract. It is "Hroþgares ham", and therefore a place of personal comfort and identity. It is also "goldsele gumena", a place of riches and community. Look at the physical identity of the hall - materials such as gold and iron are central to it. Later in this portion of the poem, weapons become briefly important and are described in terms of physicality (the material from which they are made) as well as their emotional meaning. But in most of this section, weapons are largely absent. This is, of course, because Grendel eschews weapons, but it makes for an unusual description of combat in Old English terms. There is much discussion here of physicality. Pain, wounds, and blood as well as body parts play a key role in this part of the poem, as do physical actions. Alongside this, however, there is also a great concentration on concepts of emotion and the mind. What is the weight of the two in terms of our judgement of characters? Light and dark play very important roles in this extract. Look for words for related concepts - mist, shadows, clouds, obscurity as opposed to gold, brightness, the white horses of l. 856. Consider religious diction. Grendel is described in terms of exile from God, for example. What do you make of the use of the word "wundor" in reference to Grendel's arm hung up as a trophy? Consider also the references to fate, especially Grendel's susceptibility to fate and God. The tripartite structure of the initial section of this passage is obvious, structured by the three "com... + infinitive" descriptions of Grendel's approach. Look more closely at these. How do they differ from one another? Is there a sense of development or progress across the three, or do they retard the action? Note also that each of these three sections follows a similar pattern: a description of Grendel, a comment about the hall, a comment from the narrator about Grendel's evil intentions, and a final reminder of the fate which lies in store for Grendel. Other repeated structures in this section include "draca morðre swealt" and "Wyrm hat gemealt", half-lines describing the fate of the dragon at Sigemund's hand. The different lexis contrasts with the strong structural similarity and the rhymed endings. Is there irony in the poet's statement that "Ne wæs þæt wyrd þa gen þæt he ma moste manna cynnes ðicgean ofer þa niht" at lines 734-6, considering that the very next scene is of Grendel devouring one of Beowulf's companions? How about the statement that he could not kill men "þa metod nolde"? Thinking again of irony, consider the ending of this section with Sigemund's defeat of the dragon. This is specifically brought up as a parallel to Beowulf's own triumph, and yet Beowulf will finally be killed by a dragon, not overcome one. Be aware of the poet's use of compounds and kennings. There are many of these to describe Grendel. Why might the poet choose to create novel word-forms for Grendel? (Not all compounds are novel, of course, but they often suggest a new way of looking at the base noun). Consider the use of the tale-within-a-tale here. What importance does the figure of the king's story-telling thane have? What is the importance of story-telling in the poem as a whole? Might the description of the sleeping men who surround Beowulf, and who should be guarding the hall, be an allusion to the Gospel depiction of Christ in the garden of Gethsemane, when his disciples fell asleep around him? If so, what effect does it have? "þæt wæs god cyning" (l. 862) - this precise phrase also describes Scyld very near the beginning of the poem and Beowulf very near the end (lines 11 and 2390, respectively). What is the effect of this repetition? In both other cases, the phrase stands alone as a half-line. In this case, in contrast, it is part of a sentence and is preceded by "ac" (but). Might this be significant? "wordum wrixlan" (l. 874) is a formula found elsewhere to describe speaking to others, including at line 364 of Beowulf. There is some suggestion that the technique of poetic variation is referred to by "wrixlan". In Vainglory, it comes in a strongly alliterative passage describing the behaviour of an excessive and worldly man, and so may again have connotations of variety and ornament. Assuming that the poet intends us to feel sympathy for Grendel. Might his focus on Grendel's evil intentions and state of misery instead be an attempt to build up a picture of his evil - an evil which cannot be fully put across by actions alone? If we consider the possibility that the lone, exiled figure was seen with hostility or suspicion rather than pity, then the emphasis on Grendel's hatred of companionship appears less sympathetic. This is not to say that you should write off the idea of sympathy entirely. The poet states that "No his lifgedal sarlic þuhte secga ænegum", suggesting perhaps that his audience might have been expecting a saddened reaction. Mistaking compounds for kennings. A compound does not have the same riddling, metaphorical quality as a kenning; it is simply a combination of two elements to make a word for something. "sceadugenga", for example, may be considered a kenning (although it is still not as allusive as something like "swanrad" (swan-road = the sea).) In contrast, "misthleoþum" simply refers to misty hills using the two elements "mist" and "hills". Compounds can create a variety of effects, such as strengthening the link between their two elements, but they should not be confused with kennings.